Visual Studio Code>Other>Live Share AudioNew to Visual Studio Code? Get it now. Visual Studio Live Share Audio enhances the existing Visual Studio Live Share experience, by enabling you to quickly spin up an audio call directly from within Visual Studio Code, without needing to use a separate tool or service. Participants within a Live Share session can automatically join the call, and chat amongst each other, without needing to first coordinate which voice communication tool to use. For certain use cases (e.g. online training/mentoring, hack-a-thons), this can dramatically help reduce the barriers for collaboration. Note: Both Visual Studio Live Share and the Audio extension are currently in preview. Therefore, the user experience and feature set are not final. Install this extension, then reload VS Code. Click the Live Share button in your status bar to start a new collaboration session, and invite the developers you'd like to collaborate with. Make sure the developers you're collaborating with also have the VS Live Share Audio extension installed. For the easiest onboarding experience, refer them to the VS Live Share Extension Pack, which includes everything they'll need to get started. 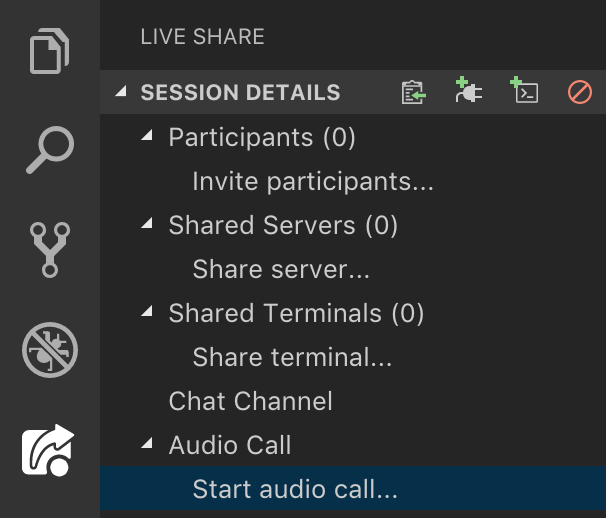 Open the Live Share Session Details view, and click the Start audio call... node in the tree to start a new call. 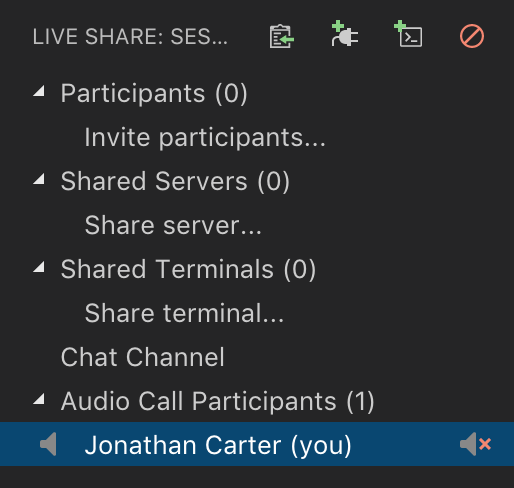 Once connected, you'll see a new Audio Call Participants node in the Session Details view, which indicates you're in a call, and whether or not you're muted (via the speaker icon to the left of your name). To mute/unmute yourself, click the speaker button to the right of your name. By downloading and using Visual Studio Live Share Audio, you agree to the license terms and privacy statement.